8 Restyling & tRuck AccessoRies | March 2015 restylingmag.com stantly bringing stuff to us." 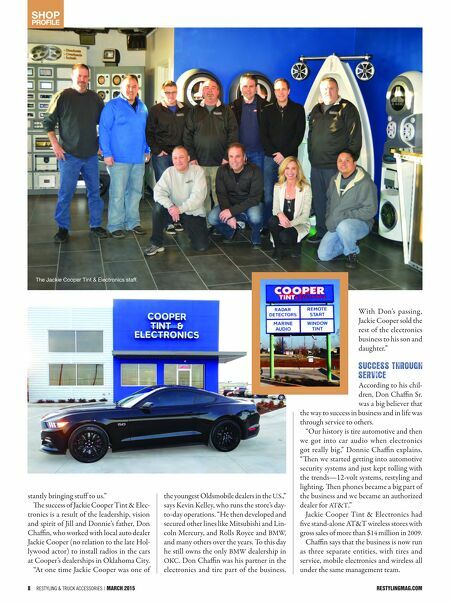 e success of Jackie Cooper Tint & Elec- tronics is a result of the leadership, vision and spirit of Jill and Donnie's father, Don Chaffin, who worked with local auto dealer Jackie Cooper (no relation to the late Hol- lywood actor) to install radios in the cars at Cooper's dealerships in Oklahoma City. "At one time Jackie Cooper was one of the youngest Oldsmobile dealers in the U.S.," says Kevin Kelley, who runs the store's day- to-day operations. "He then developed and secured other lines like Mitsubishi and Lin- coln Mercury, and Rolls Royce and BMW, and many others over the years. To this day he still owns the only BMW dealership in OKC. Don Chaffin was his partner in the electronics and tire part of the business. With Don's passing , Jackie Cooper sold the rest of the electronics business to his son and daughter." S u c c e S S t h r o u g h S e r v i c e According to his chil- dren, Don Chaffin Sr. was a big believer that the way to success in business and in life was through service to others. 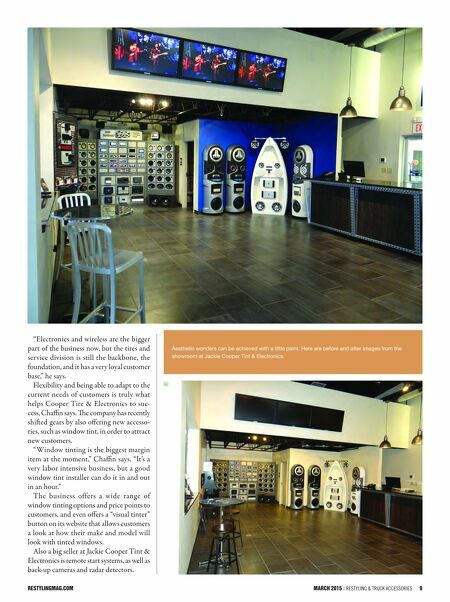 "Our history is tire automotive and then we got into car audio when electronics got really big ," Donnie Chaffin explains. "en we started getting into automotive security systems and just kept rolling with the trends—12-volt systems, restyling and lighting. en phones became a big part of the business and we became an authorized dealer for AT&T." Jackie Cooper Tint & Electronics had five stand-alone AT&T wireless stores with gross sales of more than $14 million in 2009. Chaffin says that the business is now run as three separate entities, with tires and service, mobile electronics and wireless all under the same management team. Shop profile The Jackie Cooper Tint & Electronics staff.